Active fund managers don't seem to be getting a break now, especially since their performance hasn't measured up for more than a decade. This article continues to clarify this indefensibly calamitous position they are in. We shed new light on how one can mathematically verify how weak these investment managers are, by also using more conservative statistics measures and more closely considering the selection of solid benchmarks themselves. S&P Dow Jones, in concert with CRSP, recently produced an annual table showing active security managers’ performance relative to their respective benchmarks. They also highlight a variety of decomposition diagnostics. Last weekend the New York Times also ran an appealing column on this, primarily focused on how the portion of portfolio managers who underperformed their benchmark was nearly ¾. And this statistic was fairly homogeneous across different time frames, ranging up to 10 years. Digging into these statistics further though, we see some intriguing ways to use probability theory to analyze and explain these performance differences. What we reveal here is truly amazing, in how rare it is to straight-up underperform the market, in both statistical tests: a more liberal one, and a more conservative one. To be clear, this isn’t just a risk-adjusted measure we are discussing; it is an absolute negative performance relative to the benchmark. One can examine the 10-year (quite lengthy for our purposes), equal-weighted list of their 17 fund categories and their respective benchmarks. All units shown are in annualized %. If you think the performance statistics below don't look great for an investment manager's skill, just wait. It's going to get worse as we further dive into the analysis. The fourth column shows a lot, by focusing on just the compounded annual performance differences. Ironically Warren Buffett used a similar layout to show his investment prowess, up until this year's 50th anniversary BRK report. One is correctly reading this table above. It is a clean sweep of the typical fund managers in every one of 17 categories always getting a battering by their benchmark. If fund managers -per category- were even basically the same as the benchmark (this is part of the definition), then we’d expect that they’d outperform ½ the time. It would make finding winning investors interesting. But to instead, under this assumption, to lose in all 17 categories is something that could only happen with a probability of (½)17, or once every 130 thousand years! One should be asking some hard questions, because 130 thousand years ago takes us all back to the Old Stone Age, where our family trees converge to non-religious humans just figuring out to wear clothes for the first time! But let's continue to loosen up the probability theory and try to prove that fund managers can look good. We start by unpairing this analysis. The typical 17 fund categories', equal-weighted performance, is 7.2%. All but just 1 of the benchmarks (large cap value) outperformed this: 1 of 17 is only 6%! Put differently, using just the second lowest benchmark (multi-cap value) averaging 7.3%, we see that half of the fund manager's typical performance still didn't beat that. This is wildly significant (classical analysis of means showing a t-statistic of about 5, or more than twice what's needed for statistical significance). One can see below the alarming distribution chart, for both performances. One can almost blindly pick any benchmark, and rest easy. This chart above negates any idea that fund managers were actually typically performing close to their benchmarks (what’s a few percentages between you and your banker?) But this chart shows just how ineffectual active managers have been. 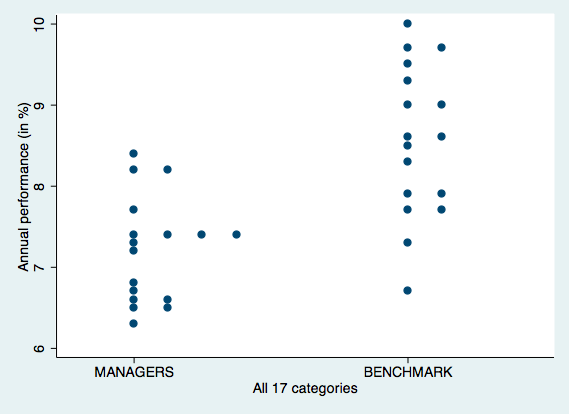 In other words one can’t state that the left (managers) and right (benchmark) distributions generally align. Rather, any random mapping of each dot on the left to a dot on the right, mostly results in connected lines that move upward, as one moves from left to the right! Looking at the probability implications of these distributions, it’s as if fund managers weren’t even competing in these markets once weekly (and emotionally perhaps that is true). If you are not getting a rebate, then perhaps you can take a chance on a passive index fund from now on. Ostensibly, it's hard to find a flimsy one.